Margaret Trawick is Massey University Professor in Social Anthropology in the School of People, Environment and Planning. She teaches the the anthropology of gender. Mags is a Marxist-Feminist who doesn't seem to like men very much. Women and girls do 2/3 of the world's work for 5% of the income. So when women stop everything stops. we cannot go on strike. Be glad we don't kill every one of you f###ers. All we need to perpetuate the species is your sperm. Funny that Marx didn't think about this. Unless they are Tamil Tiger terrorists. I specialise in Tamil society, culture and language. I have been researching the Tamil Tigers in Sri Lanka for the past seven years, and I've taken several field trips there. Margaret Trawick, stayed with Women Tigers in the Liberation Tigers of Tamil Elam (LTTE) controlled areas. She is a staunch advocate for the LTTE cause and is plugged in to the international Tamil Tiger support network. In May 1999 Trawick addressed a reportedly LTTE organised conference in Ottawa-"International Conference On Tamil Nationhood & Search for Peace in Sri Lanka"
Margaret described an incident involving an American businessman and Sam Thambimuttu MP for one of the Tamil militant groups the EPRLF and what she called a "Prawn project". The exact details were confusing, but according to Margaret, the EPRLF MP tried to play out the Tamils and in the end 85 people were killed and the "Prawn project" was destroyed by the STF. How ever she did admit that there was a LTTE involvement as well. Margaret explained this and other incidents in Sri Lanka and about her stay in the Eastern province. "Come to Kokkaddichcholai" she said. She urged others to go to Sri Lanka as tourists and smuggle their way into the Eastern province and be a "protective bubbles" towards the people there. Trawick's loyalty to the Tamil cause and antipathy to the Sri Lankan government is beyond doubt. I quote from Trawick's 2005 eulogy for murdered journalist Taraki Sivaram-a former Tamil militant and LTTE sympathiser. The LTTE did not protect Sivaram. Those ghouls who say that he was an “LTTE terrorist”wallow in their blindness. Sivaram was not a terrorist. The LTTE are not terrorists and Sivaramdid not belong to the LTTE. He could not be a war-maker because he trusted everybody. He talked with everybody. He wore no armor and neither carried nor kept any weapons. And the head of the LTTE was right to confer upon Sivaram, posthumously, the title of Maamanithar. I only wish they had protected him better during his life. Because, despite what the ghouls may say, the LTTE in no way benefits from the death of Sivaram. He was their best international advocate. Recent events in Sri Lanka are just the latest chapter in a long and tragic story. 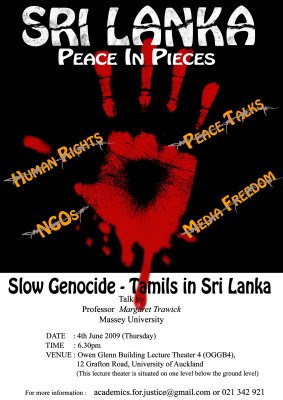 In a talk at the University of Auckland next Thursday, anthropologist Margaret Trawick will discuss the history of oppression that Sri Lanka's Tamil minority has suffered, and explain why she believes that this oppression amounts to a 'slow genocide'. Trawick has worked as an anthropologist amongst Sri Lanka's Tamils, and has witnessed firsthand the efforts of the Sri Lankan government to destroy their culture, language, and physical heritage. Yep-seems to be the more of the balanced, rational analysis that is so typical of our Mags. Sam-haven't answered first question because I don't understand its signifiance or relevance to anything I've written. Secondly the photo was given to me with the LTTE identification. Maybe it does just say Tamil Eelam, but in the context and with the picture of Tamil Tiger leader Prabharakhan on the wall, there is little doubt where Maire's sympathies lie. "SHVC’s illegal occupation of Happy Valley and associated disruptive protests..."
This is what you said in your recent profile of Metiria Turei. I'm asking what grounds you have for saying the occupation was illegal. Clear? "Secondly the photo was given to me with the LTTE identification." Does that mean somebody told you it was an LTTE t-shirt and you didn't bother to check? Amazing what those folks say about me. Some of the things said about me are straight from some organization called "Global Spies" in, of all places, Florence, Kentucky. You would think that if I am a member or supporter or in the pay of the LTTE, I would have been arrested and tried and put in jail by now. But guess what, I live in two countries ruled by law: New Zealand and the United States. These are both countries ruled by law, and the law is fair and fairly arrived at, for the most part. God knows how many times I have been "reported" by some crackpots like you guys. But no police ever come to my door, no law official ever telephones me or tries to go after me. Because these are countries ruled by law, you see? And your little slurs put me in good company. Many brave and truthful journalists in Sri Lanka have been murdered for suggesting the things I have said. You have helped show me what freedom really means, and how horrible it must be to live without it.